Color runs through our lives in many ways– it’s how we pick out the ripest strawberries and cherries, it’s how we put together an outfit, it sets a mood and conveys symbolism. Red is passion and blood, white is purity, blue is serenity or even depression. Colors are human. We see only a tiny range of electromagnetic waves, and the colors we see depend upon the frequency of that light. The colors of the world are there because our brains and eyes interpret them into the tints we see. Our brains give us that beauty. Human history is full of color. Painters strive for vibrant shades that withstand the degradation of time. We use colors in food, makeup and clothes. Often, though, we don’t consider the origins of color, and how we obtained these colors throughout history. Many were toxic, such as lead white and red cinnabar (a combination of mercury and sulfur). They chemicals were so valuable and prized that people used them even for makeup. Today, we still use eyeshadow and cherry sodas with crushed bugs, which while slightly icky, is vastly safer. Although we have many more synthetic compounds and colors, these old colors are still sometimes the best. The titanium white we use today is more opaque and less lustrous than lead white, and some suggest it may not hold up as well over time. Red cinnabar used in Roman art retains its color 20 centuries later. 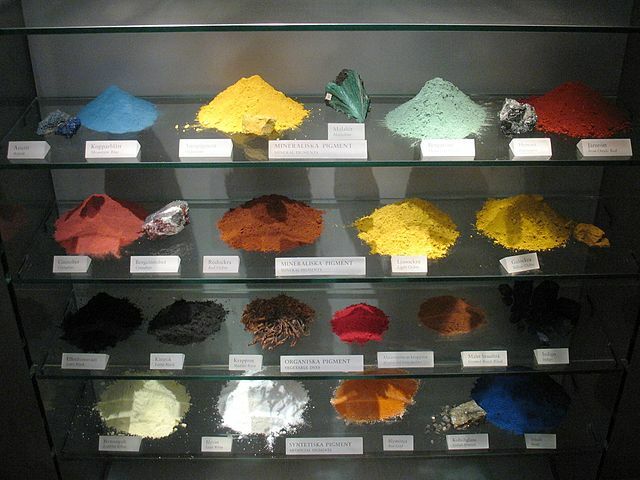 In the last two centuries, we have discovered a whole new range of color compounds with the advent of chemistry and globalization. But our goals are always the same, to stimulate the part of our brain that sees color in wiggles of light. This entry was posted in Science and tagged cinnabar, cochineal, color, electromagnetic waves, electromagnetism, lead white, pigment, red, symbolism, white on June 16, 2014 by Vironevaeh.